For the past two years I have wanted to create a makerspace in the school library. While I don’t technically have the space, I decided to set up stations to make it happen. The week I set up the stations was the most fun we have had in a while. 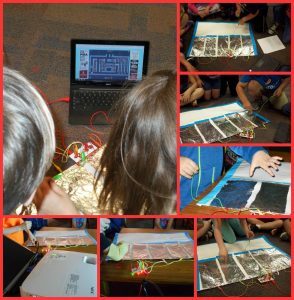 I set up four stations for the students to rotate around, a Makey­Makey station, a Littlebits station, a Stikbots animation station, and a Chalkboard tabletop. One week I had 1st, 3rd, 5th, and a Life Skills class. Each class left the library all excited about the next time they will visit. The collaborating and creating among the students made the journey to having a makerspace well worth it. The first station was the Makey­Makey. The Makey­Makey website describes it as “an invention kit for the 21st century. You can turn everyday objects into touch pads and combine them with the Internet. It’s a simple Invention Kit for Beginners and Experts doing art, engineering, and everything in between.” This is a great way to get your students creating new ways to interact with the computer. To start off I created a piano out of paper, tinfoil, and duct tape. This was my way of introducing it to the students. We have explored playing PAC­man, the bongos, piano, and even created a human piano this week. The students are looking forward to next time when they are going to be able to explore other ways to control the computer. The next station was a Littlebits station. 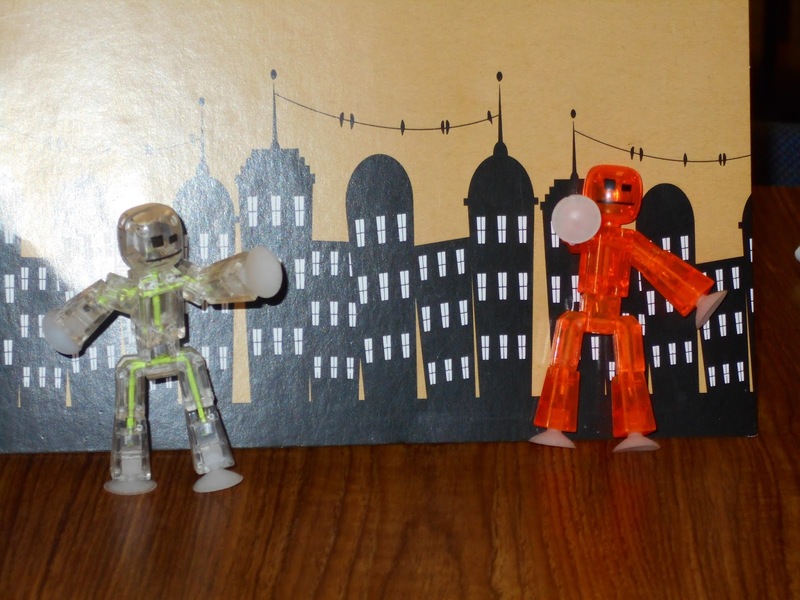 According to the website, Littlebits allows students to create inventions with easy-to-use electronic building blocks. 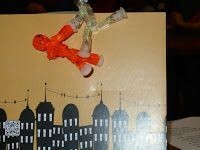 The students have enjoyed creating everything from a buzzer, siren, a light switch, and even a prank handshake today. Littlebits is perfect for collaboration and problem solving. 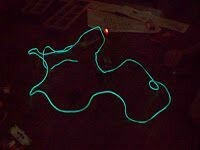 If the circuit didn’t work the students quickly set about trying to discover how to fix it. 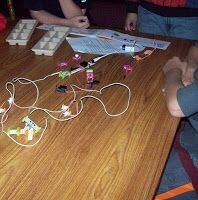 The exploration of circuits and electronics is a great way to show your students how engineering and technology go hand in hand. After exploring at these two stations students had a chance to go “old school” so to speak. 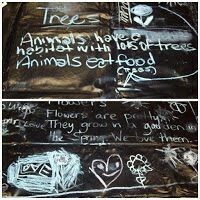 I purchased a Chalkboard Tablecloth for my students to use to create responses to books or research in the media today. I took advantage of the fact that it was National Poetry Month and had the students research on Wonderopolis “What is a haiku?” Then the groups had to work together to write their own. 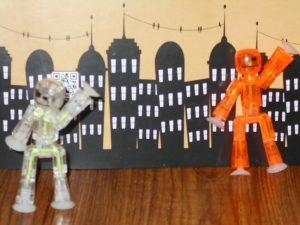 Our last station was the Stikbot station; where the students used a simple digital camera and Stikbots to create a stop animation movie. This station will take a couple of weeks to finish. One day the fifth graders had the bots doing the “Whip and Nae,” climbing up walls, and more. Needless to say the makerspace was a big hit with both the students and myself. I am looking forward to watching the students create, design, collaborate, and problem solve their way through each station. I am also planning to add a craft-making station as soon as I collect enough supplies. If you have been considering starting a makerspace in your library I would strongly recommend it. I am so happy that your makerspaces are working out so well in your center! I do have a question though; do you have scheduled times to work with these class groups? In other words, are you working with a fixed schedule, and the students are in your center already for book check out? We have a flexible center and our makerspaces are just available for students to choose from if they come in for that purpose. I am on a semi-fixed schedule so the students use the Makerspaces during media time. Last year I didn’t have the stations out all year just on certain weeks. This year my goal is to have stations during and after checkout for the students just to explore. 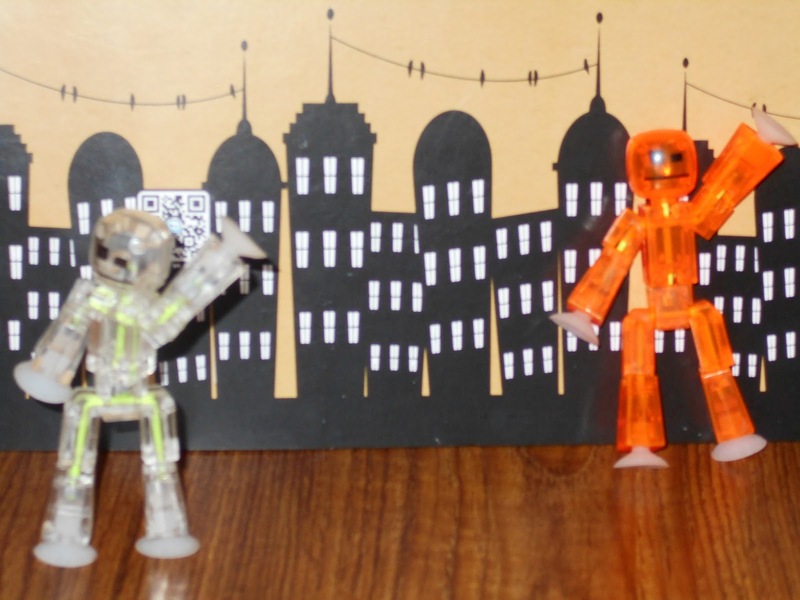 I am also planning to dedicate Fridays to Makerspace challenge activities. Where the students have a certain task to complete at each station. I am hoping to open up the Makerspace section of the media center to teachers next year during the morning when I don’t have classes so they can bring in their classes to create products that demonstrate skills they are learning in the classroom or just to explore. Great, thank you! What a great way to allow students to use their creativity and critical thinking skills. I want to do what you have done! I am going to implement it next year! I can’t wait! Thank you for sharing your ideas on centres for library time. I was curious when most maker areas are “open” in the library or if it is open to anyone, anytime. Do you find centres a challenge to manage if you have check out at the same time? Do you constantly change up the centres or have similar activities for students to build upon their previous skills?